The next stage is to add points of interest. Move the map so that you can see the location of the tourist attraction. In the tool bar, select the “Tourist Attraction” tool . On the map, click on the place where the attraction is located . 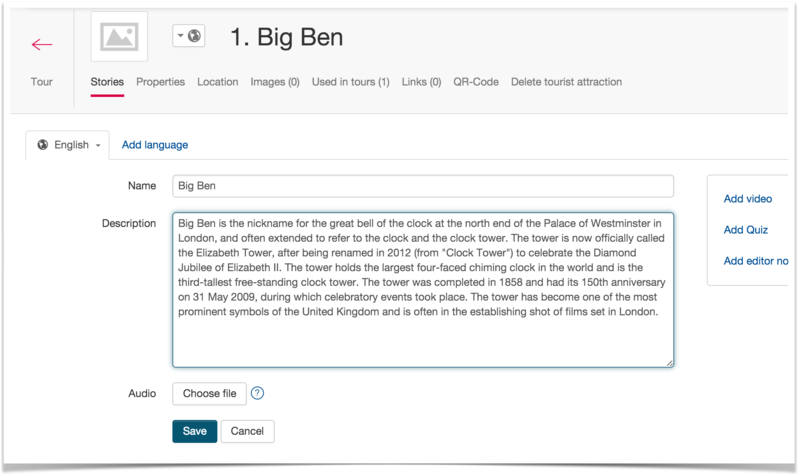 In the pop-up window, name the tourist attraction and click on “Create”. Now the attraction’s icon, encircled by a trigger-zone, has appeared on the map, in the location that you clicked on. Also, a panel has appeared on the left, containing a list of the tourist attractions. Click on the name of the tourist attraction. In the newly opened window, go to the “Stories” section. Upload an audio story about the tourist attraction by clicking on “Choose file”, next to the “Audio” parameter. If you don’t have a story available yet, skip this step. You can upload the audio later. Go to the “Images” section. 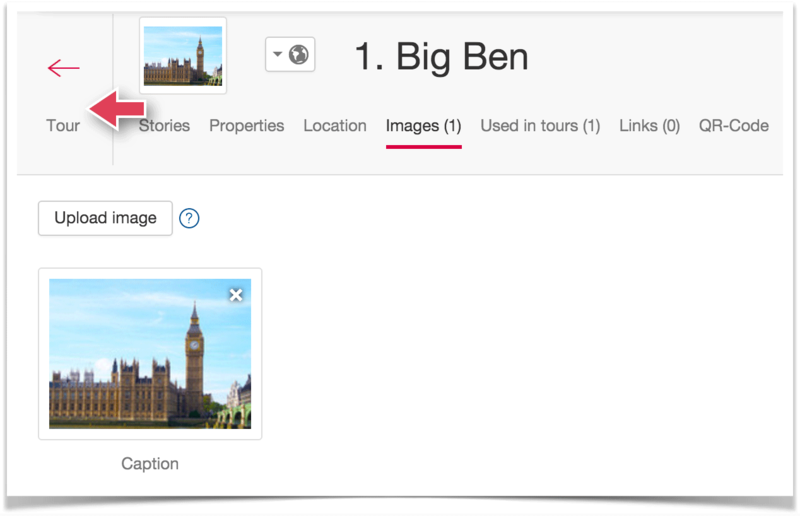 Click on the “Upload photo” button. In the new window, select the chosen file. The selected image will be uploaded and will replace the default picture. The first point of interest has now been completed. To return to the tour window, click on the arrow. 4. Create other tourist attractions following the steps described above. Now, having created two tourist attractions on the map, we can add the tour path.